Sharpening operational efficiencies, reducing waste and improving tenant and visitor experience are key objectives for facility executives and the building service contractors who serve them, but these goals can be challenging to meet, especially in large buildings. Restrooms pose a particular concern, since these are typically associated with high use and therefore require attention and monitoring from often over-stretched janitorial staff to keep them clean and sufficiently stocked with paper towels, toilet paper, soap and hand sanitizers. Even so, diligent restroom maintenance is critical since a poor user experience can negatively affect how the entire facility is perceived. Consider the Hartsfield-Jackson Atlanta International Airport, which sees more than 100 million passengers annually, according to Kofi Smith, president and CEO of Atlanta Airlines Terminal Company (AATC), which maintains the airport facility and building systems. This volume can thwart the best efforts to “deliver a world-class” experience, says Smith, adding that nevertheless, striving for this objective is essential. Because of this need, and the obstacles that can get in the way of meeting it, Smith says they’ve turned to Internet of Things (IoT) technology, installing sensor-enabled restroom devices that help them address issues before they generate complaints. AATC installed and activated IoT technology in 10 restrooms (four men’s, four women’s and two family) on the B Concourse — the busiest in the airport. Currently, all towel, tissue and hand sanitizer dispensers on that concourse are IoT-enabled. In four of the restrooms, AATC is also testing IoT-equipped flush and urinal valves and faucets. Paper towel outages, which upset passengers, have dropped by more than 50 percent since the installation of smart technology, says Smith. Waste levels have remained at their previous lows. 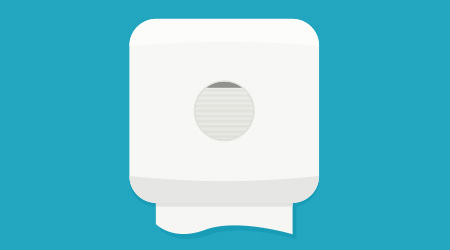 Gains in efficiencies, driven by the ability to obtain data relative to restroom usage and traffic, as well as alerts signaling product outages, dispenser malfunctions, low batteries (among others), are inspiring more facilities to consider smart restroom technology. For example, CBRE, a Los Angeles-based commercial real estate services and investment firm, has piloted and installed systems across the United States, says Bruce Grawert, managing director-category management. The systems are being installed in facilities of up to 1.5 million square feet and include those in the financial, manufacturing and life science sectors. CBRE first became aware of IoT technology and its possibilities through the company’s supplier partners who were beginning to explore smart restroom systems and their use as a way to competitively differentiate both BSCs and the facilities they served, says Grawert. One such company is ABM Industries, a New York-based provider of various facility solutions. 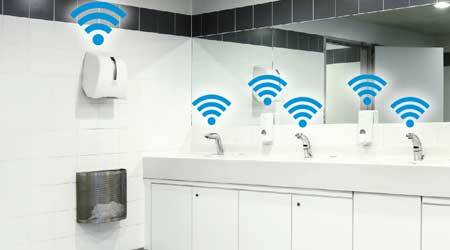 Tom Gallo, the company’s head of strategy and transformation, says ABM is piloting restroom IoT technology in multiple locations, including corporate headquarters, campuses, airports and commercial office buildings. In most cases, ABM is bringing the IoT solution to its clients and piloting and implementing the programs, says Gallo. This requires ABM to research and select the appropriate technology, coordinate the installation, train cleaning staff and management, monitor the data and educate clients on interpreting the results so they can understand the value. ABM also assists in helping facilities identify what they are trying to achieve, such as an improved user experience, greater custodial efficiencies, cost savings,waste reduction, etc. Smith describes the BSCs serving the airport as “critical partners” in the implementation of IoT technology.